We bought an F150 a few weeks ago at Cambrian Ford and have had nothing but negative experiences since. The financing documents had my maiden name on them which caused a major headache for the automatic withdrawal of our car payment. I have had to send in copies of my birth certificate and repeatedly follow up with Ford Credit about this. Im not sure how this could happen given that a credit check was performed, copies of my ID were taken etc. all with my married name on them. In addition, we needed to have a tire replaced and the service department bungled our appointment and the quote for the tire. When I showed up for my appointment I was told that I was mistaken, that I didnt have an appointment booked and that the tire had not been ordered. I had to call customer service myself in order to determine that they had booked the appointment under the wrong name. Once that was resolved, I was told that the tire still had not been ordered and that the price of the tire was actually $150 MORE than the price quoted by phone the day before when I placed the order. The customer service rep (the same one that patched me over to parts and then booked my appointment afterwards) asked if I was sure if I ordered the tire. Why would I make an appointment if I didnt order the tire?? There was no admission of a mistake regarding the quote. When I assured them that I was certain of the quote and asked them to consult the person in parts that I had spoken to, I was told that although they had narrowed it down to one individual that I must have spoken to, unfortunately he is "in Toronto on training and cant be interrupted". This person is somehow unreachable by telephone, or email, or any other mode of technology available in 2017. Not only did customer service refuse to honour or even investigate the quote given over the phone "because there is no paper trail", they did not admit to making a mistake and downloaded the error to me as if I was confused about the price explicitly given to me by phone. I understand that mistakes happen and am reasonable if they are admitted to. Condescension, repeating the phrase "I understand your frustration" and downloading the error to me does nothing to validate my concerns. I have never such frustrating and negative experiences with customer service. I regret buying at Ford and I definitely regret buying their service plan. The service department didnt even realize that we had just bought the truck there. She said to me "you didnt buy this vehicle here though, did you" ..... I bought it three weeks ago at your dealership. How can you not be aware of this? If this is just the first few weeks I can only imagine how it will go for the next 5 years. I recently purchased a new F150 from Cambrian Ford and cant say enough about their Service, from the moment I walked into the showroom to deciding on a specific vehicle for me. I was wowd by the efforts of Jeff in sales who took the time to put me in a Vehicle I wanted and despite having 100+ trucks on the lot I was looking for specific equipment options, colour etc. and Jeff enlisted the help of his Management Team to find it. My search began on a Thursday of the long weekend and I decided to buy a Ford on Friday to which Cambrian found exactly the vehicle I was looking for by the end of the day and had me taking it home the following Wednesday, again keeping in mind it was the long weekend. I cant say enough about Cambrian, a real class act to follow to which I even took the time to contact Ford to let them know they had 2 winners on their hands. One is the F150 and two is their Dealer Representative Cambrian Ford. What a pleasant buying experience and yes, I am loving my new Ford F150 too. Purhased a used 2015 f150 from Cambrian on a Saturday, everything looked good on it and we were happy. Went in to pick it up on the Monday to find a big scuff on the bumper (paint matched black to the truck). The sales guy (Jeff) told me that he would have it buffed out and we agreed if it wasent fixable they would re paint the bumper. Waited about a month and a half before they got our door latches in for warranty replacement and they were supposed to do the bumper at the same time. Picked up the truck today and the scuff/scratches are still there. Went and talked to Jeff and he told us he never said they would paint it even though I clearly told him I would not buy the truck if it was not fixed. True definition of saying anything to make the sale. Service department was great but now we have to go through Ford Canada and possibly OMVIC to have the problem fixed. Lots of hasstle for nothing. I walked in to the service department and the second I got to the counter, their friendly staff were quick to acknowledged my issues with my vehicle, offered to scan and address the issues immediately while I waited. They even offered to drive me where I had to go, as well as pick me up afterwards. I had nowhere that I needed to be, so I waited around the showroom. A gentleman by the name of Robert (Paquette) introduced himself, and offered me a coffee while I waited. 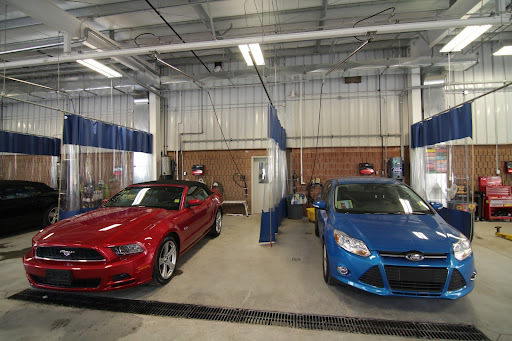 The quick service with my vehicle was an overall great experience with great people. I highly recommend this dealership to anyone for their automotive needs. Purchased an 08 Kia Rio with only 44,000kms over at Cambrian Ford.. They serviced my car with my free oil change and tire rotation for them to make me wait 3 hours and as soon as I left the lot my alignment was off when it was perfectly normal before this all happened. I bring it back and they make me wait 4 hours to simply rotate my tires to give me a bill of $112 over their mistake not aligning my car properly in the first place ? awesome customer service Cambrian Ford ! so why bother going to Cambrian Ford when clearly there are several professional dealerships in town ? I was shopping around for a car and Im glad the customer service here was terrible! It made me come to my senses and wonder why I ever was considering a Ford! The sales guy I got was a typical sleeze, constantly calling me and telling me he needed me to complete the "deal" that day because my "special" price would be gone (even though I have access to the X plan). I would avoid at all costs. Disclaimer: I am sure Ford trucks are the best out there, but I personally would never buy a Ford.